I'm sure you've heard about the gaming crash of 1983. Even if you're too young to remember it personally, the event is still talked about and referenced today. 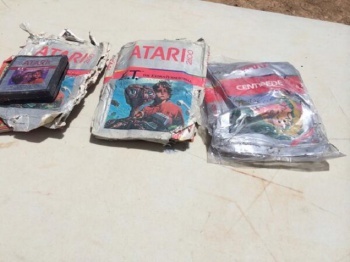 If you're curious to learn more about it, I highly recommend the documentary Atari: Game Over, which shows the excavation of a landfill where thousands of copies of the supposed "worst game ever made" were buried, and uses that to talk about what happened to the industry. According to Wikipedia, the crash was caused by a flooded console market and competition from the nascent PC gaming scene. I'm sure those are both true, but as someone who lived through the time period I have to say I think the drastic drop in overall game quality was also a major factor. I was a kid and didn't follow business news. I wouldn't hear the term "gaming crash" until decades later, but even as a child I was aware that something had gone wrong with my hobby. For context, I got my first Atari game console in 1979 or so, and quickly became obsessed with it. On birthdays and Christmas, all I wanted were more Atari games. The problem was that cartridges were absurdly expensive. They cost $40 in 1979, which comes out to almost $150 in today's money. New games were hard to come by, so they needed to last a long time. My first clue that things had changed was probably sometime in 1984. I was 13 years old. I found myself standing in the now-defunct Hills department store and looking, as I always did, at the selection of Atari 2600 games. Normally displayed on fancy shelves beside high-end electronics, the now-battered cardboard boxes had been carelessly dumped into a common clearance bin. They were marked 90% off. $5! I actually had $5 in my pocket. I could buy one of them, right then. And yet despite the fact that I was obsessed with new games, I couldn't find a single title that looked worth my $5. Even with that extreme discount, I wasn't willing to risk my allowance on any of them. My last few gaming purchases had all been duds, and these games looked like they would be more of the same ugly tedium. Atari wrongly thought that quality didn't matter. Their games had been dropping in quality for years, and for a while nobody seemed to notice. (Or rather, the ratio of terrible shovelware to genuinely fun quality titles had been getting worse.) Remember that this is more than a decade before the commercial internet, and long before the gaming press had developed. Consumers - particularly kids asking their parents for games - typically didn't have anything more sophisticated than word-of-mouth for learning about the quality of a game, which means the fall in quality made every purchase more risky. This wasn't obvious at first. If you were disappointed with a game in 1983, it was easy to assume you were just unlucky and that one of the other titles on the shelf would have been better. You had to get burned a few times before you realized you were essentially hunting for gold in a landfill. Once that realization hit home, everyone became very shy about buying new titles. The point is that quality matters. Maybe this seems obvious, but the trap for a publisher is that quality doesn't matter right away. While it's understandable that publishers like to keep their sales figures secret, it really is unfortunate. I suspect that long-running franchises suffer from the problem where individual entries are punished for the sins of the previous one. While it's hard for me to imagine dropping $60+ dollars on a game without consulting reviews beforehand, apparently a large segment of the audience does exactly that. If a series puts out a dud entry, longtime fans still buy it reflexively without looking at the critical reception. The shortcomings of the bad game don't hurt the publisher's bottom line until the sequel, when that same fan spends their money on something else. I can't prove this, of course. But it would explain why publishers seem so sluggish to respond to bad decisions. If Shoot Guy III has decent sales but a lot of controversy and backlash, the publisher sees it as a temporary PR problem. Then when Shoot Guy IV comes out and sales are down, the publisher asks themselves what they did wrong with Shoot Guy IV, and not what went wrong with the previous game. I'm bringing this up because I think we've once again hit a point where publishers think that quality doesn't matter. Specifically, they're blind to how much damage loot boxes, tacked-on multiplayer, and microtransactions do to the intended experience. A few weeks ago Rob Jones, senior producer of NBA 2K19 spoke to Trusted Reviews and said, "[virtual currency used to unlock loot boxes] is an unfortunate reality of modern gaming. Every game, at some point, in some way has currency and they're trying to get additional revenue from each player that plays the game." I think it's darkly hilarious that he admits that loot boxes are "unfortunate" while still defending their use. Game budgets have been skyrocketing for years as developers chase ever-greater levels of graphical fidelity. Developers will spare no expense to squeeze every last pixel out of the graphics hardware, but then knowingly harm the central gameplay loop by adding loot boxes, with full knowledge that this move will harm the perceived quality of their product. They'll go broke chasing graphical bling, but then throw the gameplay itself under a bus chasing extra dollars in the form of microtransactions. That is a very backwards set of priorities. If you take the normal gameplay loop of defeating enemies to level up and bolt a slot machine on top of it, you've fundamentally changed the nature of the game. Previously, you had to engage with the combat mechanics to gain power. Now you play the slot machine to get that power. From here, the game designer has a strong incentive to create things in such a way that you'll want to put money into the slot machine. Their incentive is no longer to make a game fun and satisfying, but one that's frustrating enough that you'll be willing to put in more money to escape the frustration. The publisher looks at the money loot boxes bring in and imagine they'll get that money in addition to their normal sales. But what happens after players realize their once-beloved game is now a slot machine? Like 13-year-old me deciding that new games were a rip-off at $5, players might realize that there are better places to spend their entertainment dollars. In that same interview, Jones went on to point out that nobody is forcing you to pay for in-game items. He implies that this means there's no harm done. But if I'm playing a skill-based game where my skill takes a backseat to a slot machine, then the central appeal of the game is gone. I can either engage with the loot boxes and essentially buy my way to victory, or I can muddle through the slow frustrating grind, always feeling like I'm playing a sad incomplete version of the game. Neither of those experiences sound like they're worth $60 to me. It might take some time, but sooner or later the buying public will lose interest and become wary of these titles. Likewise, if I'm playing a multiplayer game and I'm looking for a level playing field on which to test my skills against other players, then the presence of pay-to-win loot boxes will damage the entire experience regardless of whether or not I buy any. Yes, publishers can make lots of money from loot box obsessed "whales". Sometimes you hear stories about people dropping thousands on microtransactions. If a whale spends $1,000 on loot boxes, it means the're worth as much as 16 regular customers to the publisher. The problem is that those whales are only interested in buying power if there's a large pool of non-whales to steamroll. If the player base begins hemorrhaging users, then even the whales might lose interest. Publishers hoping to gain from both groups might wind up with neither. Today, the industry is too big and too diverse to have a crash like the one that hit in 1983. Even so, publishers shouldn't be complacent. Even if the industry itself is too big to collapse, individual franchises can. It only takes a couple of bad entries to kill a brand. Publishers shouldn't be afraid of the momentary backlash. They should be afraid of something far more dangerous: A gradual apathy from former fans as they look for someplace else to put their $60. Once they leave, they will be very hard to win back. Shamus Young is a game developer, a novelist, and author of a book-length analysis of the Mass Effect trilogy.